Welcome back to the Million Dollar Case Study: Europe. It’s been a few months since we last updated you on the progress of our public product launch in the UK marketplace. Spoiler alert: the launch went well. Keep reading to find out how we expanded our Amazon FBA business in Europe with great success. Greg and I wanted to share the progress of the UK launch, how the other products are doing, and what our plans are to keep moving our public Amazon business towards the $1 million revenue figure. The Jungle Slumber sleeping bags are shifting some serious units on the UK Amazon store. In fact, we were even quite surprised to see such fast growth in the first two months. Taking a look at the sales overview in Fetcher, you can see that there has been a nice steady growth over time since launch. When I first launched (so, when the products landed in the Amazon UK warehouse), I was averaging 2-3 units per day. In little more than two months, I am now selling up to 30 units per day. Remember, getting sales in early is crucial to the long-term success of your product. When you launch a brand new private label product, with a new listing, you are starting from square one. In order to build up your rank, you need to get some sales velocity and sales history behind you. Well staying true to the initial strategy outlined back in Session 15 on Amazon product launches, I combined a deep discount using the UK deals marketplace on Jump Send, and combined that with some pretty aggressive Amazon PPC (sponsored products) campaigns. As you can see I was selling each unit a for £8.10 for the promotion, and making a loss on each unit sold at this price. This investment in the future success of the product it crucial in the early days. I also set up an automated email campaign in Jump Send. This helps to put my customer support on autopilot and free up some of my time, whilst improving the customer experience and increasing the chances of getting some honest reviews on the product. Let’s take a deeper look at how Amazon pay per click advertising has helped to generate early sales. First of all, if you missed it, make sure you head back to Session 16 where we covered how to create new Amazon PPC campaigns for a brand new product launch, or check out our free ebook here. As always, we started with an Automatic campaign to mine for keyword opportunities, alongside setting up some well targeted manual campaigns. Then, over time it’s a case of consistently optimizing these campaigns and maximizing return on investment. When the product launched, we were seeing an average ACoS of 80% or more. That means we were making a loss on each product sold because the cost to get the sale was very high. Since January though, the ACoS has fallen to 37%. This is a few percent above my “break even”, which is the point at which I am no longer losing money on each sale. Over time, and with future optimizations, I want to get this ACoS even lower. This will mean that my campaigns are generating sales, while still generating profit. Profit is the all important figure. When I first launched the sleeping bags they were new to the market so it cost more to advertise them. Over time, with the rank improving, reviews building and the campaigns being tweaked, I can start to leverage my PPC for profit, rather than sales velocity. In the meantime, my organic sales are growing too, and making up a larger proportion of my daily and weekly sales. Product Quality – The more time you spend sourcing a high quality product at the best possible price, the less headaches you will have down the road. Sourcing a high quality product that people will love is one big step on your journey towards getting lots of reviews. Product Branding – The perceived quality of your product also comes down to how well it is branded. If you spend some time building a good brand, ensuring your packaging is of high quality, this really adds to the customer experience. Remember, people buying on Amazon don’t always realize their product is from a small business. You have an opportunity to delight them when they open their Amazon parcel, which increases your chances of them spreading the good word! Customer Support – I set up three simple automated emails in Jump Send as shown in this article. This gives the customer an opportunity to hear the voice behind the brand, and to know that we care about their experience with the product. Jump Send can help you to get positive reviews as well as prevent negative reviews by having an automated returns email sequence in place. A Strong Listing – It’s really important to set expectations early, and that means before the customer makes a purchase. 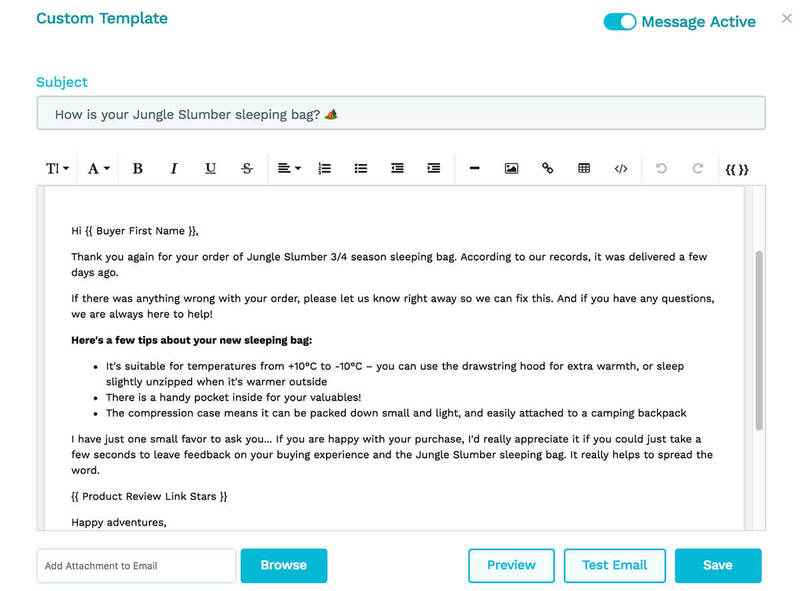 Ensuring that the Jungle Slumber listing set the scene for a good review early on by including lots of information about why this Mummy sleeping bag is the best of it’s kind. Put yourself in the customer’s shoes and write your listing for them. Overall the reviews have been positive, and returns rates have been extremely low (under 2%). Though there have also been some less positive reviews. Try not to let the bad reviews dishearten you after you have poured a lot of time into sourcing a great product. Take all reviews as feedback that you can utilize to improve the product and the customer experience. I developed a great relationship with the supplier of this product, who is just as eager to hear customer feedback as I am, and willing to act upon it. Overall, the launch went much better than I anticipated, especially where sales and revenue are concerned. I am also hitting “breaking point” with profit just two months in. So the extra costs of launching a product are already starting to decrease and my product is now turning a profit. Yet the product still ranks pretty low on the first page for my core keyword of “mummy sleeping bag”. Greg’s take on this was that because this product is new, it doesn’t have that much sales history, despite the daily sales increasing and performing as we would expect. So once this product has been selling for a little while longer, we might see a bump in the ranking for some of the top keywords. Those of you who followed this case study from the start will know that this is my first real product launch. With Greg’s mentorship, I found, sourced and launched this product by myself and tackled every step of the process myself. There were some roadblocks, but they were easy to overcome. Whether it was getting the Amazon Europe Seller Central account approved (which took a few weeks), or trying to figure out whether to use air freight or not. Each step was a learning process and though some were more frustrating than others, with perseverance I still ended up with the same outcome. Upfront investment pays off. It might sound scary hearing that you need to lose money on your first sales, or spend more on advertising to get your product ranking. But it really does accelerate your launch, which pays off in the end. We have demonstrated this with every Million Dollar Case Study product launch, so it’s not a one off win. It’s a blueprint that truly works. The whole process feels so much easier the second time. All of the smaller details make sense to me now, and when I am faced with the challenge of launching a product again I know I can go ahead with confidence. That’s part of what makes this business model so scalable. Greg also shared a useful insight that even if you launch a product and it doesn’t fly, perhaps you don’t make much money or make a small loss. You will at least walk away knowing this entire process from start to finish and that is invaluable knowledge for launching a business as an entrepreneur. Not every product will perform as well as the last, but you can of course take measurable action against failure. We have now launched three successful products and 5 SKU’s using the same process, in two marketplaces. 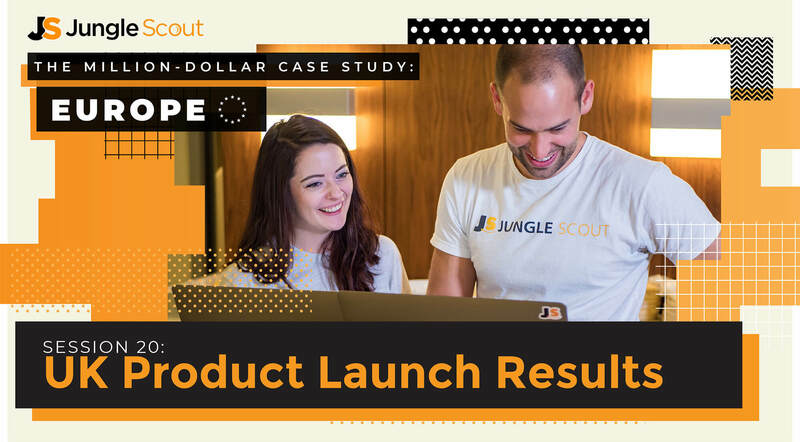 Using the Jungle Scout Web App to find product ideas and track them over time to verify their opportunity has been the key to launching three successful products in a row. 3 months post-launch… what happens next! Although Jungle Slumber has been off to a fantastic start, I can’t just hope that success will continue. Running an ecommerce business requires a level of determination that ensures you maintain a competitive edge. I wouldn’t want to ruin the chances of a product bringing in consistent profit month after month by thinking my work here is done. Optimize PPC campaigns – during launch I wasn’t afraid to spend money on getting a sale, but during the product lifecycle, I need to be laser focussed on optimizing for profit. This means spending some time each week ensuring the campaigns are performing well and improving them consistently. For more about ongoing campaign management, check out this useful article on PPC optimizations. Improve the product – I already have some customer feedback which I have sent to my supplier. We are working together on the next order and implementing some small changes. If this prevents negative reviews, these small changes can have a big impact! Trademarks and Brand Registry – Getting a registered trademark for your brand name or product takes time. We have trademarks for our Jungle Stix and Jungle Snugs products and this took several months to process. I need to start thinking about this early for Jungle Slumber. We are well over the half a million mark now, and that is only going to grow over time. Our public Amazon business has been growing nicely over the years. In 2016 it generated $191k with just one product, in 2017 that grew to $268k with two products and now we have a third that can continue to grow the business. To continue with full transparency, here’s how the other two products are doing this year so far. We’re just about to go into the busiest period of the year for this product (spring, summer and fall are great times for roasting marshmallows). So we’re ordering some extra inventory to prepare for this, using last years annual figures to project inventory requirements. This product is growing nicely, though some SKU’s do perform better than others. We’re going to put a plan in place to shift some excess stock of the white baby hooded towels, which have started to cost us in storage fees. Meanwhile the pink and gray baby hooded towels are selling well and we’re going to be ordering some more inventory. All things considered, the business is running great without too much of our time and attention. But we do sometimes fail to put some of our own advice into practice. Things like inventory management to prevent running out of stock, and ongoing product listing optimizations, sometimes get pushed to the bottom of the priorities list. So in order to keep this business in motion and to regain some of our competitive edge, our very own Becky Frost will be joining the MDCS team, and managing the orders, optimizations and admin tasks. This is a collaborative effort and she’s very excited to get stuck in and pick up some of the stuff that Greg and I have been behind with. Need to outsource Amazon business tasks? Did you launch an Amazon business to regain your time, only to find yourself spending hours on admin and optimizations? Now you can find the brightest freelancers to take care of some of those tasks for you. Free up your time today by visiting Jungle Market! 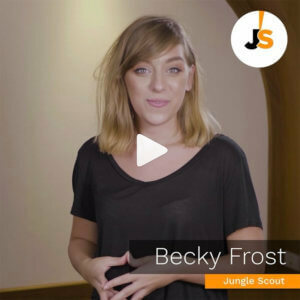 To hear the latest updates on how the case study products are doing from Becky and the Jungle Scout team. make sure you are subscribed to our YouTube channel and following our Instagram account. Thanks so much for your support throughout the Million Dollar Case Study. We’re keeping things going and we’ll let you know when we have exciting new content and updates to share! Hello and thank you for this update! Is this the latest update for the UK Case Study? What has happened in the past few months? Looking forward to seeing your progress in the European Market! I believe that it is the last one for now. However, Rolando has been working on the new Million Dollar Case Study here on the site. How do you automate the accounting side of your Amazon uk business ? Any recommended services/accountants ? It’s one of our apps and works in all major Amazon markets. Hey Guys. Glad to hear the update. I’ll be launching in the UK / EU soon and have been using the case study (and JS products) to help the launch. Did you go with Pan European or a different option? If you could reply about this or give any recommendation that would be great. Thanks very much for this insightful progress update. Love the lessons learnt and reflection on performance so far. I noted that the sleeping bags are just about to break even after +$17k revenue which is great. Would you say whether you think this is quite high in terms of a break even point and also can you confirm what this point was driven by? Would you say it was mainly the costs of the initial inventory purchase or the aggressive marketing campaign that set this as the point above which you’d turn a net profit?